A graphic novel written by Hameed Catel and illustrated by Pluto. 90 pages long, 26 cm by 17 cm. Black and White pages with some colour insert. 100gsm white matt paper. 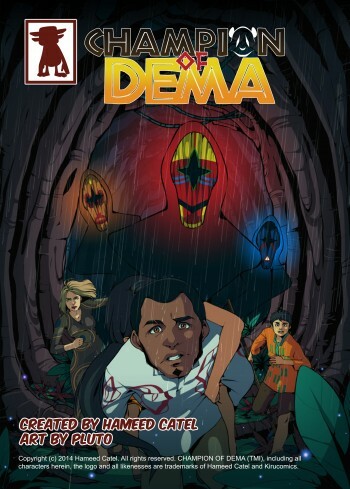 In the village of Dema, a Champion is magically chosen at random every ten years to uphold justice and defend the village against evil beings known as soul-takers. A new 10 year period has just begun and Kade has been chosen as the new Champion of Dema. Unfortunately for everyone Kade is a self-serving, tactless, opportunistic thief used to only looking out for himself. He will gladly enjoy the celebrity status of being the Champion but has no intentions of taking on the responsibility or doing the work. Will the village be able to convince him to face his responsibilities? And will Kade learn to care about others and instead of just himself? Find out inside.